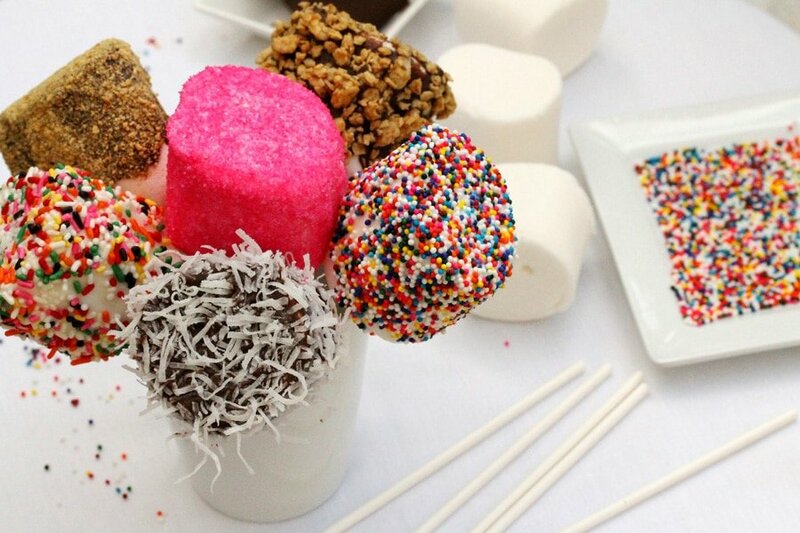 These fun marshmallow pops don’t require a special occasion to make. These are so fun to make so I decided to call them “Marshmallow Fun Pops”. This recipe includes granola, shredded coconut, and various candy toppings but feel free use your favorite toppings. You could even customize the candy topping colors to match a party theme, school colors, or maybe you would just like to make S’mores! I actually had some graham cracker crumbs on hand and used them for a topping. If you want to make a S’more Pop, an option would be to actually get whole graham crackers and break them in small pieces rather than using the crumbs; you may get more of the graham cracker taste that way. 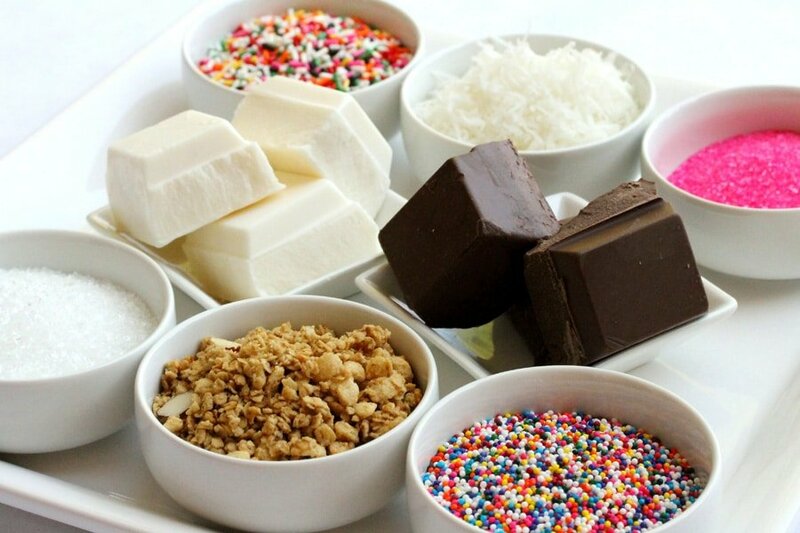 For the Candy Coating and Toppings: Vanilla and chocolate Almond Bark candy coating, candy sprinkles, granola, shredded coconut or other toppings you may like. 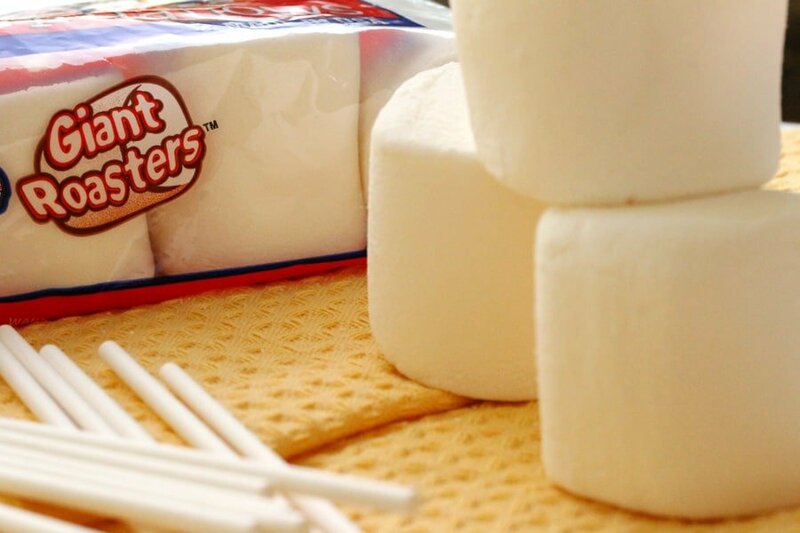 Insert a lollipop stick into each of the marshmallows stopping about 1/8 inch under the top of the marshmallow. Put each of the topping ingredients into a separate small bowl or plate. The colorful candies are such a nice contrast against the white of the marshmallow. On a large platter or two large plates, lay out the sheets of wax paper. 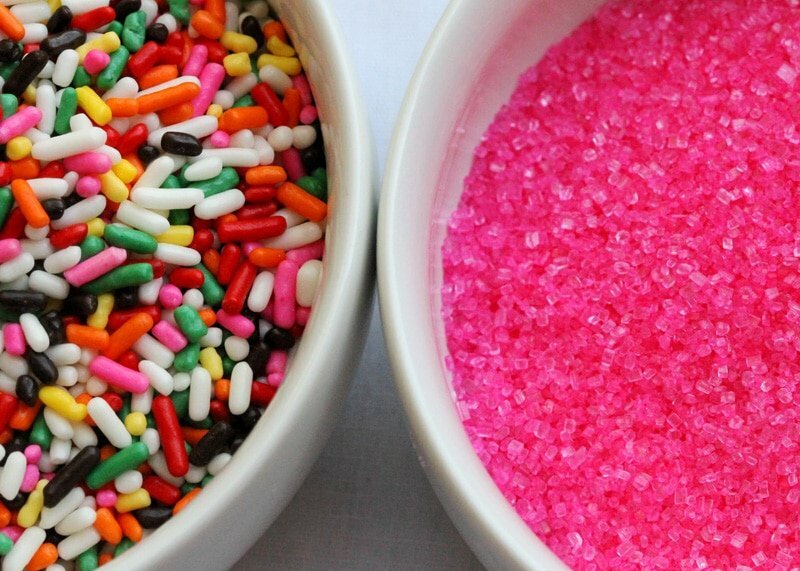 In separate bowls, melt the candy coating in a microwave on 30 second bursts making sure to stir between each 30 seconds. 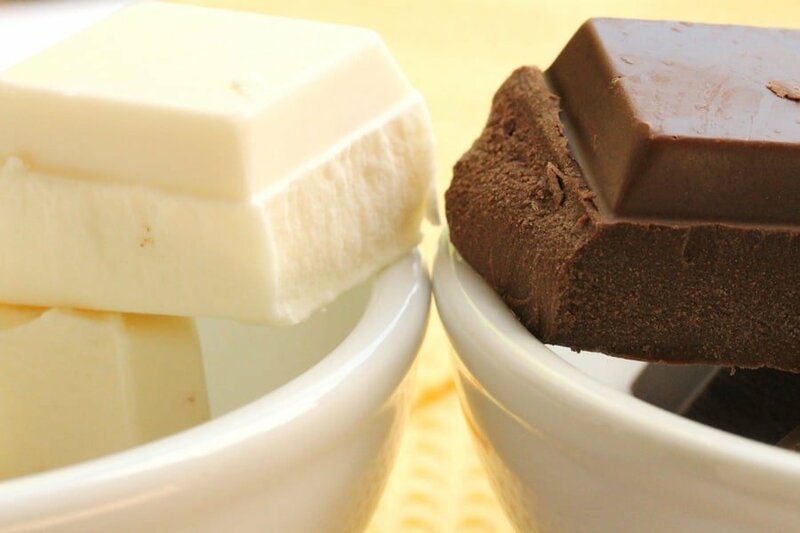 Roll the sides of a marshmallow in either the vanilla or chocolate candy coating. 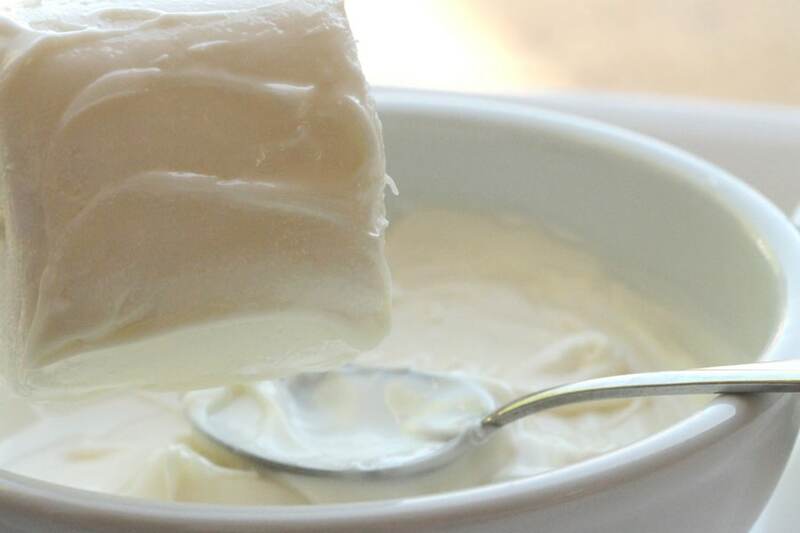 Have a small spoon handy to smooth out the coating on the marshmallow if it’s too thick in a particular area. Then dip the top side of the marshmallow in the candy coating. 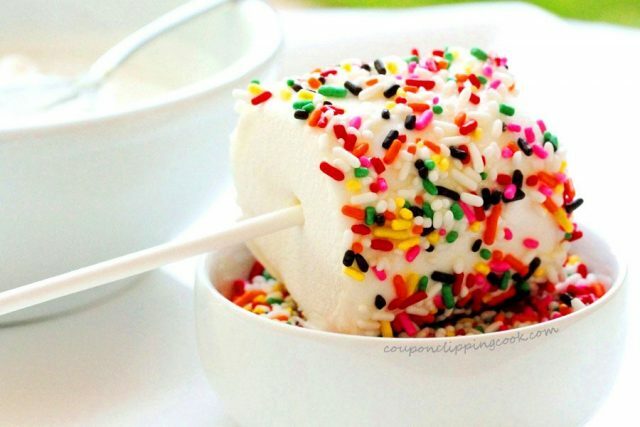 If you would like a multi-colored coating, use a spoon to drizzle the opposite color coating over the fully coated marshmallow (if you have multi-color coated marshmallows you may want to put the candy topping on just the top of the marshmallow so the multi-colored drizzles show up nicely on the sides). 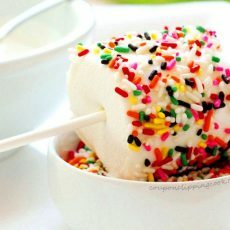 Dip the sides and top of the coated marshmallow into any one or more of the toppings. 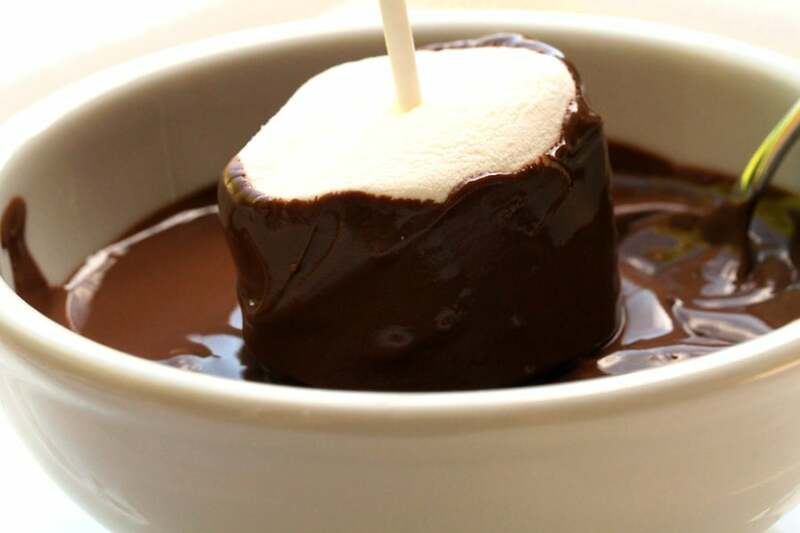 Here’s an example of topping a chocolate candy coated marshmallow. 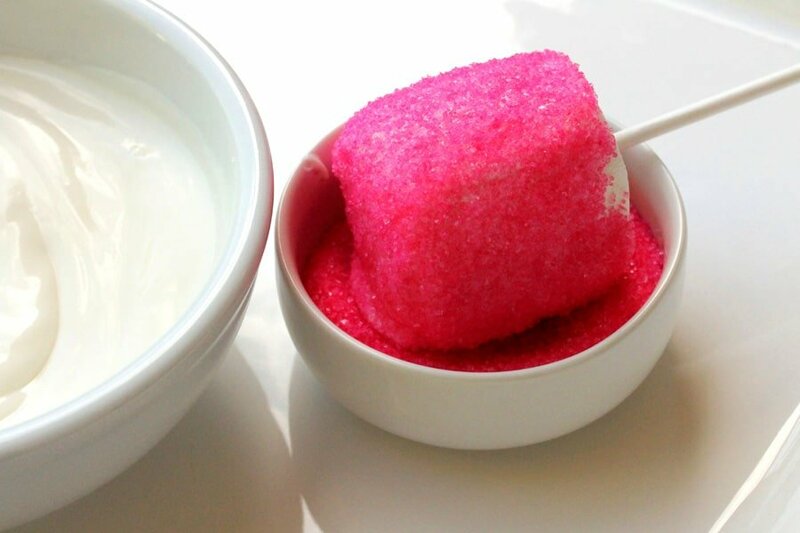 Here’s an example of topping a vanilla candy coated marshmallow. Then lay the candy coated marshmallow top side down on to the wax paper and let cool. Repeat the steps above for the remaining marshmallows. 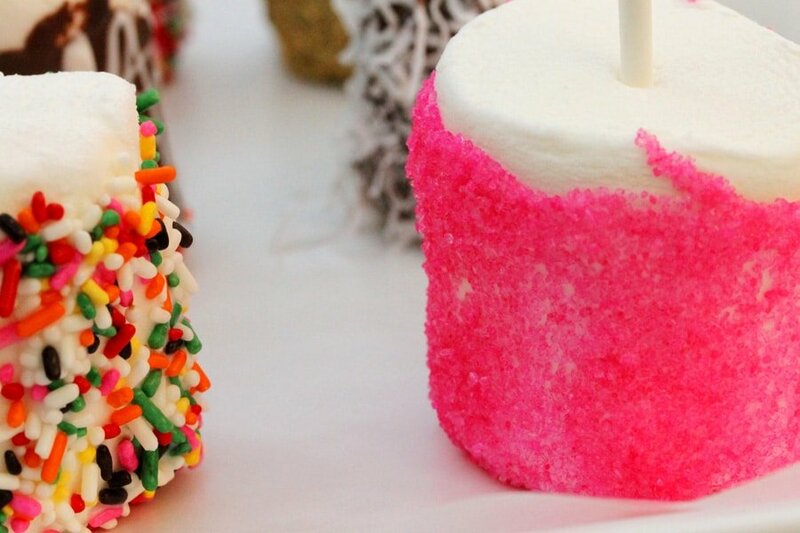 These fun marshmallow pops don't require a special occasion to make. Insert a lollipop stick into each of the marshmallows stopping about 1/8 inch under the top of the marshmallow. Set aside. Put each of the topping ingredients into a separate small bowl. Lay out 2 sheets of wax paper on a large platter or two large plates. Set aside. 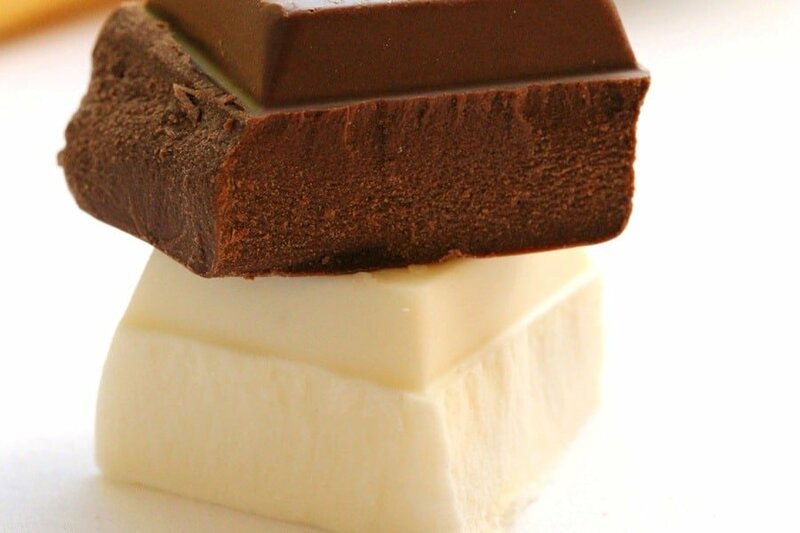 Roll the sides of one marshmallow in either the vanilla or chocolate candy coating. Have a small spoon handy to smooth out the coating on the marshmallow if it's too thick in a particular area. Next, dip the top side of the coated marshmallow in the candy coating. 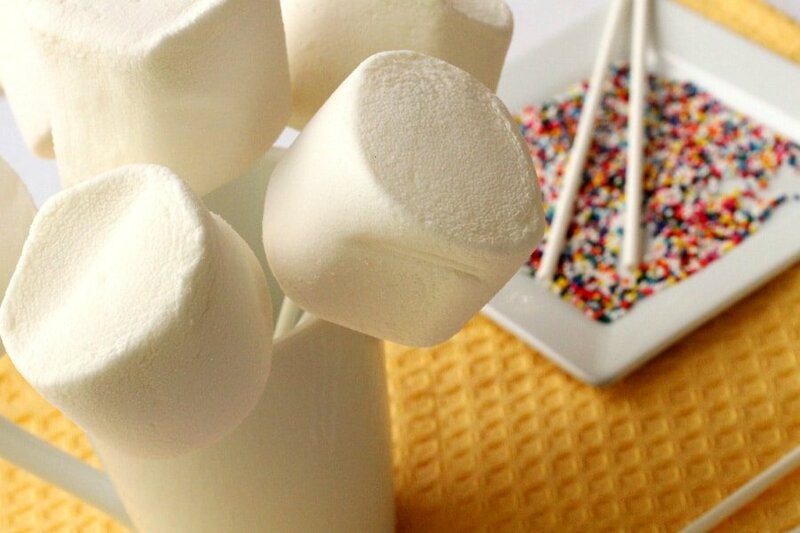 If you would like a multi-colored coating, use a spoon to drizzle the opposite color coating over the fully coated marshmallow (if you have multi-color coated marshmallows you may want to put the candy topping on just the top of the marshmallow so the multi-colored drizzles show up nicely on the sides). 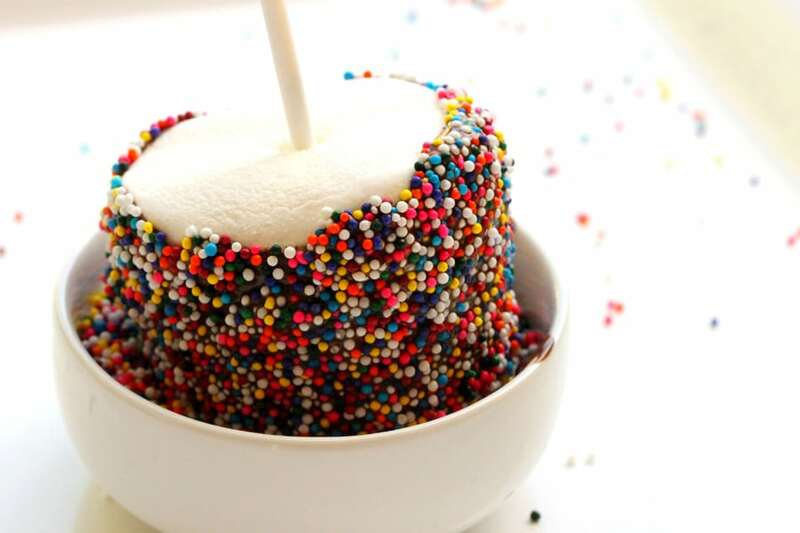 As soon as possible, while the candy coating is still warm on the marshmallow, dip the sides and top of the coated marshmallow into any one or more of the toppings. Then lay the candy coated marshmallow top side down on to the wax paper and let cool. Repeat the steps above for the remaining marshmallows (one marshmallow at a time so that coating will be warm enough for the toppings to stick). I want to make them for my daughters party on the 30th. Would the refrigerator be better? Will being in the fridge for so long ruin them? Hi Vanessa, so glad you like these! I actually ended up making these and then setting them out on the counter for a day before I had time to take the photos that are on the post. They should do just fine on the counter. I set them stick-down in coffee mugs and gently laid plastic wrap over them. Thank you so much for stopping by and Happy Almost Birthday to your daughter! Would toothpicks work? I don’t have any lollipop sticks and need to make them soon. Hi Sarah, I think that toothpicks may work on the regular size marshmallows rather than the giant ones. Or perhaps even stick pretzels may work too, then the stick can be eaten too. Thank you for stopping by! 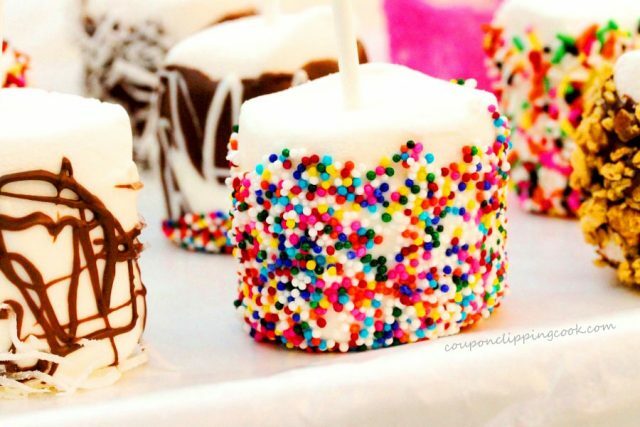 I think I’m going to make these by dipping the marshmallow in the chocolate, then rolling it in crumbled graham crackers…. a new spin on s’mores! Hi There, that sounds delicious! These are great! I plan on making them for my daughter’s wedding reception in December. We are planning a hot cocoa bar. Hi Rachel, so glad you like them. And what fun to have a hot cocoa bar at your daughter’s wedding reception. Have a great week! Wow! What a great idea! I think I might make these for my brother’s birthday. I’m thinking of doing it as a DIY station. Quick question: If I melt the chocolate before the party, how long do you think it will last? And if it doesn’t work out, will the marshmallows be fine with chocolate syrup? Hi Ashley, the melted chocolate starts to harden up pretty quick so it would need to be melted right before the marshmallows are dipped in it. 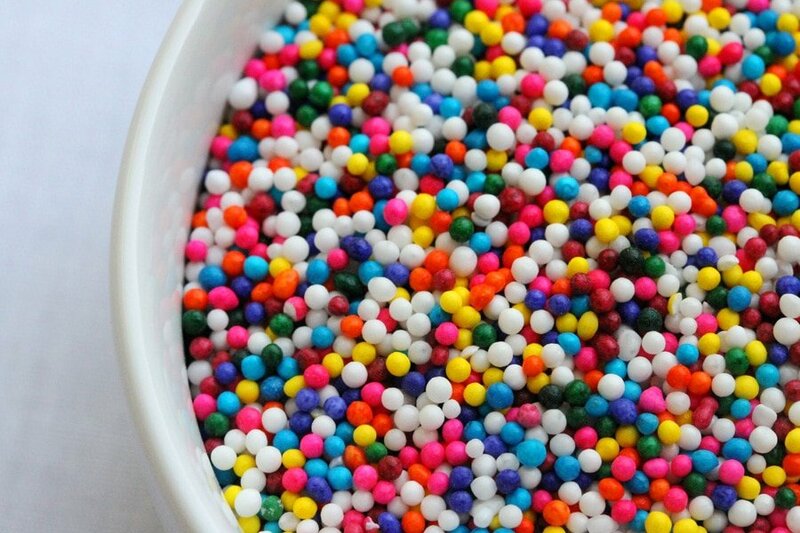 The candy sprinkles would stick to the chocolate syrup but the syrup would probably stay wet to the touch. So if the marshmallows are going to be eaten right after they are decorated then maybe the chocolate syrup would be ok. Another thing I might try is to look at the shelf with all of the ice cream toppings in the grocery store and see if there is another option that wouldn’t have to be melted like the topping Magic Shell….but I’m not sure if that would work. Maybe experiment with the different options ahead of time just in case. Have a nice weekend! I just found this when googling for baby shower ideas. 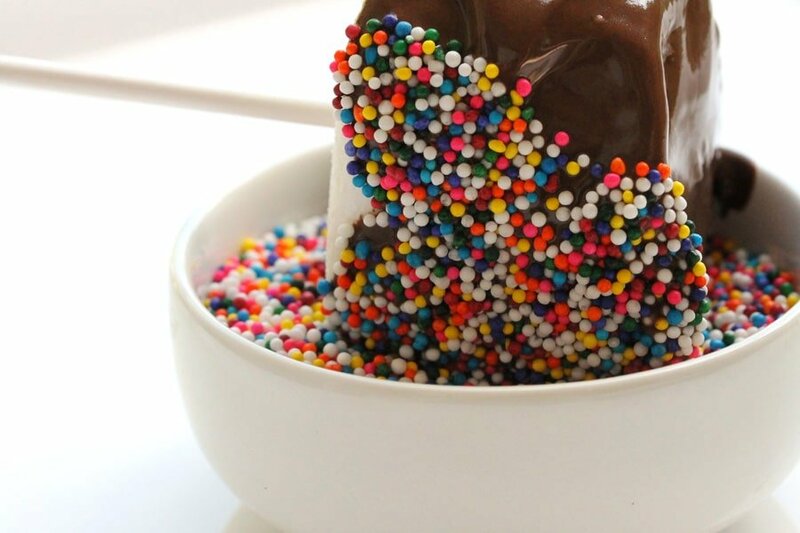 Do you think I could dip the marshmallows in melted chocolate chips and then sprinkles? 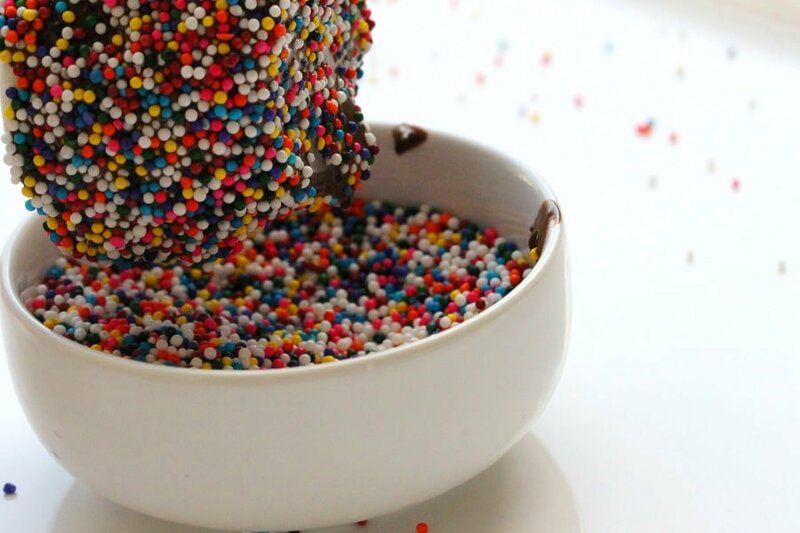 Hi Sina, yes, melted chocolate chips should work just fine…and then dipping them in sprinkles would look (and taste) great! 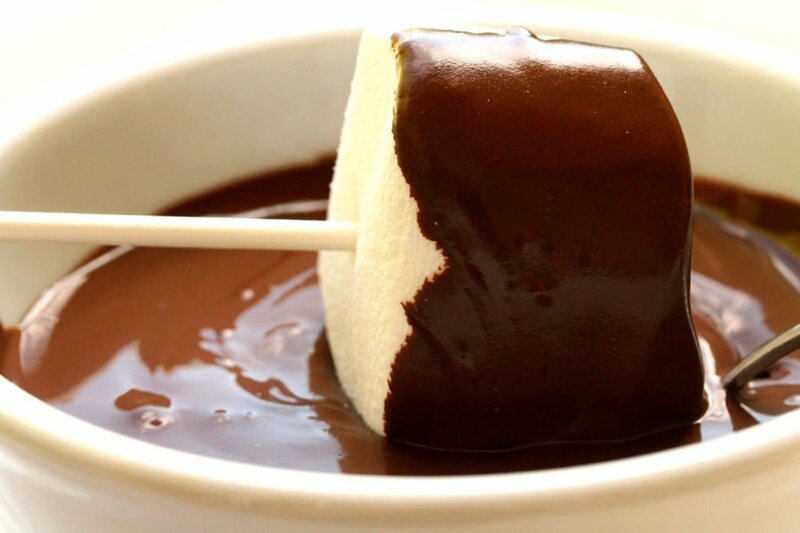 The flavor of the melted chocolate chips would taste delicious on these marshmallows. I’m making these this weekend for my sons baptism on Sunday. If I make them Saturday, will the marshmallows still be good on Sunday? What’s the best way to store them until Sunday! Freezer, fridge, kitchen counter? I just don’t want to mess these up! They are so cool! Thanks for sharing! Hi Jenny, what a great idea! It will be just fine to make them on Saturday. The best way to store them is on the kitchen counter. Just use some plastic wrap to cover them. I actually did the same thing and made them a day ahead of time. Then put them on a plate, then put plastic wrap over the top of the sticks…. and then around the sides so that the marshmallows don’t dry out. They will be delicious and fun for your son’s baptism. Have a great weekend! SO wonderful! Do you think I can make them and freeze ahead of time? Bday party next weekend…but I want to make them tomorrow? or early next week? Hi Danielle, I think that the freezer may make the biscuits a little dry. But, an option is to make the biscuits out of Bisquick instead of by scratch which should save you some time. Or, to save even more time, you can use the pre-made biscuit dough that comes in the tube-type container in the dairy/deli dept. of the grocery store. Have a great Bday party next weekend! We are thinking of using this idea as favors for our wedding but we obviously can’t make them on the day. So how long will they last if you store then in cool place so the chocolate won’t melt? 1 day? 2 days. Maria, I actually tested this out; I set about 5 of them aside by putting them in a mug (stick side in the mug) and then wrapping the entire marshmallow and mug with cellophane (I ran out of daylight and wanted to take pictures of them in the next few days). They did just fine, the chocolate didn’t melt and the temperature outside was pretty warm (I set them on the kitchen counter). The one thing I noticed was after about 4 days the candies dried out just a bit and the color wasn’t as bright. With some of them I actually wrapped them in clear wrap (the kind you see over gift baskets) and tied a bow around them and they seemed to keep their color longer. These are really a good idea for wedding favors since you can decorate them with your colors. If you wrap them up tight I think they should be fine for 2 days. I’d love to hear how this works out for you if you use them. Congratulations on your upcoming wedding! Those are fantastic! And your pictures are unbelievable, some of the best I have ever seen. Would you mind if I featured them on my website: cuteeverything.com? TY! Hi there, I’m glad you liked the pictures. Sure, it would be great to see these featured on your website. Thank you for asking. Your site is so nice….I love all of the cute things that you’ve found! I saw this and just had to try it. Finding the marshmallows was hard – but they had them at a local walmart. The lollipop sticks at my local craft store were too small, so I improvised with skewers and cut off the sharp ends. Everyone RAVED at the large size of the marshmallows – I was a hit at the Girl Scout beach day! Thank you CCC! Hi Alex, what a good idea to use skewers! I’m so glad it was a hit! Thank you for letting me know. CCC. Whoa – I was just sharing marshmallows w/my Dad this weekend to celebrate his b-day & thinking nothing could be better. You’ve proved me wrong! Question: Is it easier to find lollipop sticks at a craft store than the supermarket? I never see them, except when I’m NOT looking for them! Hi Tere, yes, it’s much easier to find the lollipop sticks at a craft store than in a supermarket. The kitchen-type stores in a mall also may carry them but the price is much better at the craft stores. I know what you mean regarding finding things when you’re not looking for them! Funny how that works out. Happy belated birthday to you Dad! I think you just made me the hungriest person in the world! That is seriously the most delicious marshmallow I have EVER seen! What a great idea. 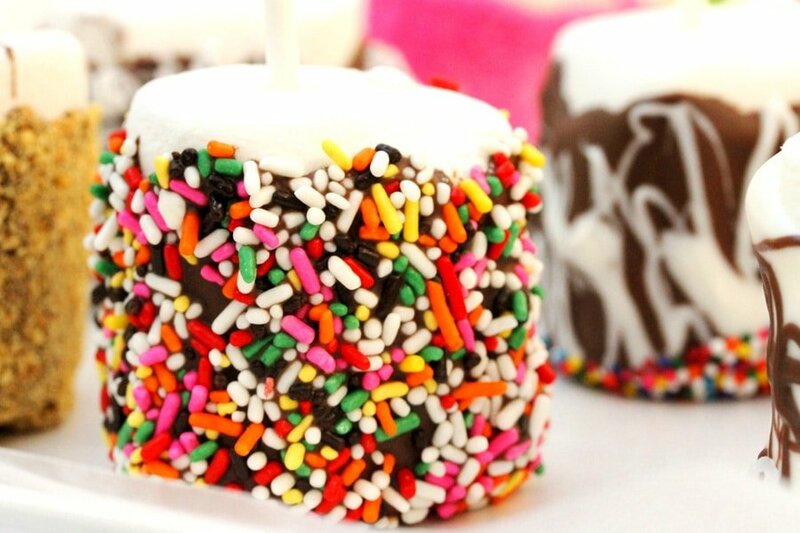 I see those cake pops everywhere, but these look way better. Thanks! this is a cute idea! Maybe not for Jordyn’s party since you will be outside and i could melt. Thank you Lisa. Yes, the candy coating may melt if it’s sitting outside too long. Maybe an idea is to put them in the freezer for just a short while before serving to make them last a bit longer. I’m sure kids would have fun making these. I know I did so I guess big kids can have fun making them too! These look wonderful. My kids would love these. They like anything marshmallow. 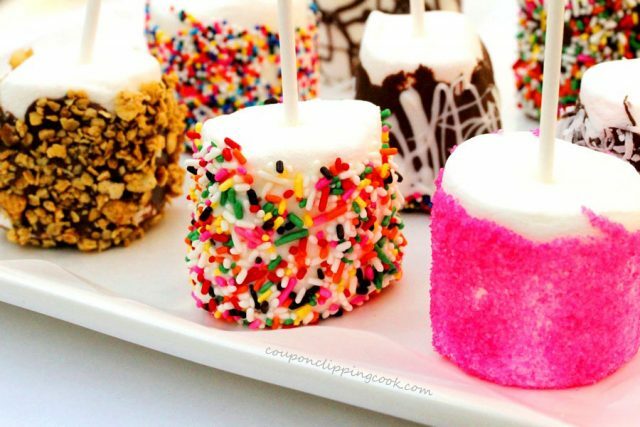 I can see a saturday afternoon with a marshmallow pop making session with lots of sweet fun. Hi Jackie, thank you. This would be a fun and tasty thing for your kids to do on a Saturday afternoon! 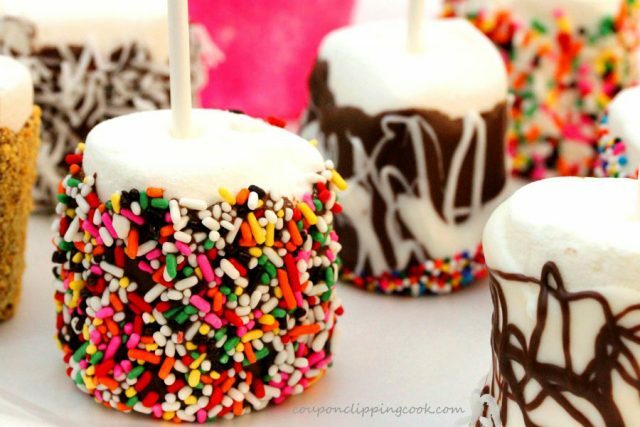 The marshmallow pops don’t even need to be pretty to taste good either! Great idea for something sweet without a lot of fuss! 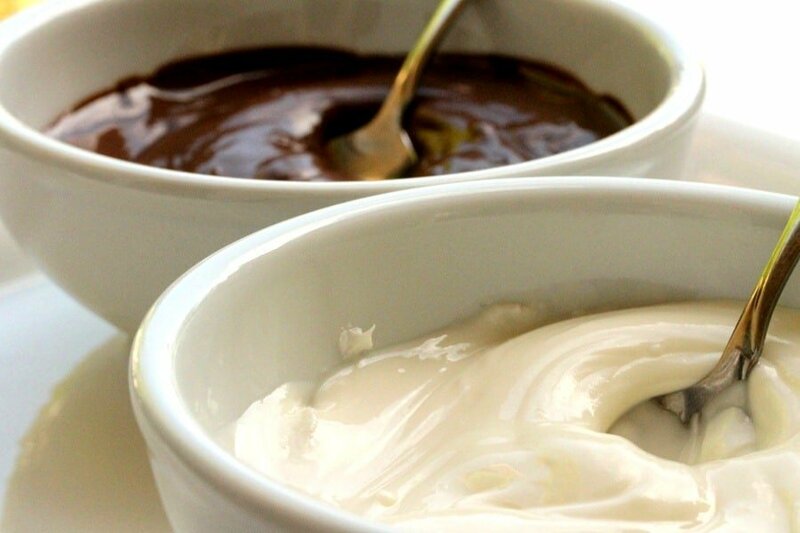 I am sure the kids would love to dip up their own along with eating these up.Thanks for sharing. Hi Tina, you’re right….this is a great recipe for kids to make! Hi Amber, thank you. 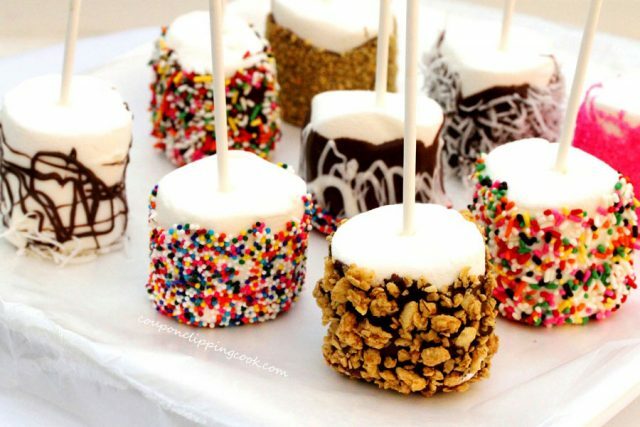 The hardest part of making these is trying not to sample each marshmallow with a different topping!